GREEN BEAN PRICING IS SHOWN IN THE VARIETY CHOICE DROP-DOWN LIST. These green coffee beans are sold in 80 Oz (5 pound) bags (exc. Costa Rica Dota, which is sold in 2.5 lb. bags). Please note that the bags are heavy kraft paper, as green beans need to "breathe" and should not be supplied in our usual foil & plastic bags. Do bear in mind, however, that green beans in these bags, if stored in a dry and cool area, will retain their full (when roasted) flavor potential for over a year. 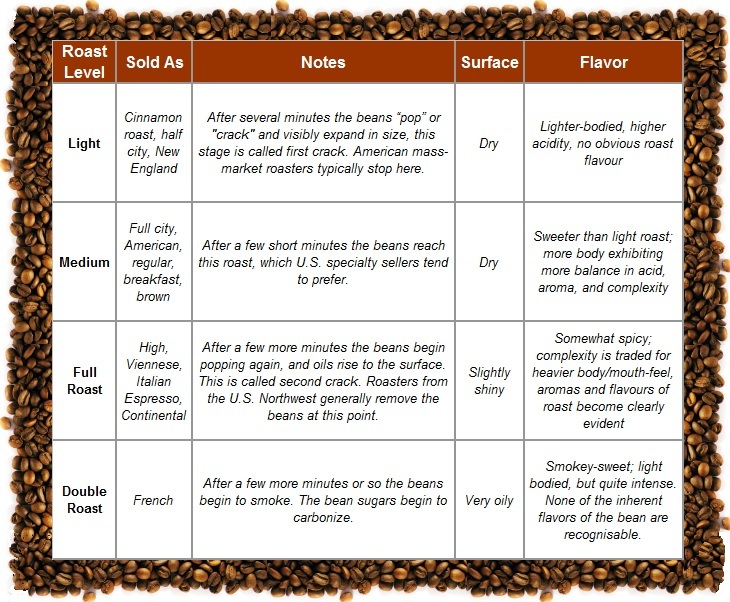 See Below & on our "About" section for charts that describe the various roasts & grinds of coffees. First of all, before we forget, you should keep in mind that, though coffee right out of the roaster smells the best, it's flavor is NOT the best. Freshly roasted coffee contains a lot of CO2 gas which is emits (called "outgassing") especially over the first 24 hours. Consuming the coffee during that first day is likely to treat the drinker to a sour taste that will be gone on the next day. Thus, the best, freshest coffee is to be had the day after it is roasted. This peak of freshness lasts about a week, though, when stored in the right bag, and cool, dry place, it would still be great for some time longer. ...and much thanks to that site's creator, Michael Allen Smith. Another idea that is affordable, and creates an even more uniform roast is the combination of a stirring electric popcorn maker (ie: West Bend Stir Crazy) base with a countertop halogen convection oven top. The only mods needed is to replace the plastic stirrer with a homemade metal one (from a metal coat hanger) and, possibly, making any adapter out of sheet metal so that the top fits to the base. Total price? Under $100...a quarter of the price of a fully automatic commercial roaster capable of roasting a pound of beans at one time! Other than these two methods, the only affordable methods are fully manual...a dry cast iron frying pan, a "Whirly-Pop popcorn maker, or a special-purpose hand-cranked roaster on a stovetop. These work. But, for uniform roasting, and no burning, you'll be stirring, or cranking, your roasting apparatus for 15-20 minutes. It is "the nature of the beast" that, if you walk away from any of these roasters, your beans will irretrievably burn in seconds!